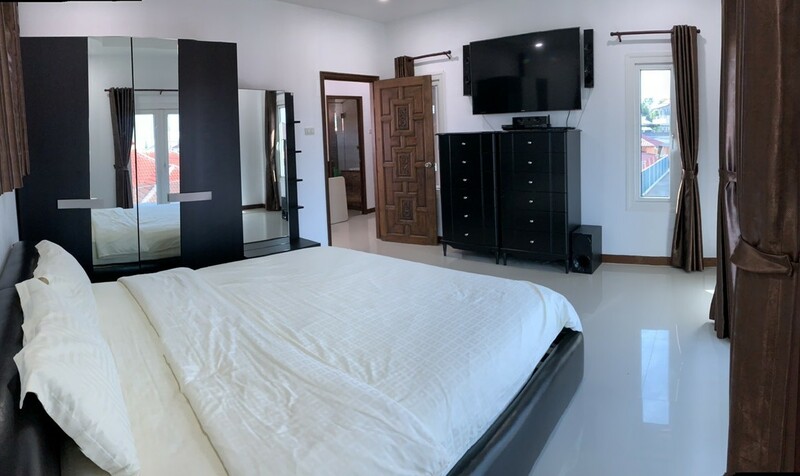 Master Bedroom with bathroom en suite and dressing room. Spacious landing with a large double size Jacuzzi spa. Fully fitted European kitchen with island and fully integrated appliances, granite worktops and breakfast bar. Bathroom, with shower sink and toilet, accessed by Jack and Jill doors from the bedroom and lounge. Large double garage at the back of the house which can fit 2 pick up trucks with space for multiple bikes and pool table with automatic roller shutter door. Landscape garden to the rear, with patio accommodating a small garden table and chairs. Recently fitted double glazing with Low E glass, double opening doors and windows throughout the house. New curtains which also have anti UV material, have just been fitted. The roof has been sprayed with Polyurethane thick foam to assist with insulation of the house keeping the house cooler and reducing electricity bills. Burglar alarm with sensors fitted, with key fob activation, CCTV fitted covering all areas of the outside of house.